Most of us have some imperfections in our natural teeth. Fortunately, with advances in dental technology, it is now possible to fix almost all types of dental problems, cosmetic or otherwise, expertly. However, many people defer getting problems like minor misalignments, gaps in teeth etc. fixed. This often happens because most believe that traditional braces are the only solution for misalignments in the teeth and other similar issues. But that isn’t the case. Modern-day orthodontic options like Invisalign can help fix minor faults in your teeth, improving the appearance of your smile. At Westside Dental Associates we offer Invisalign as part of our orthodontics solutions. Many of our patients have questions like-Are traditional braces better or Invisalign? Need readjustment at regular intervals. What Makes Invisalign An Attractive Option For Many People? Invisalign slides very comfortably over your teeth. Once you become accustomed to wearing them, you won’t even know they are there. You can also eat, drink, floss and brush as normal which makes maintaining oral hygiene very easy. 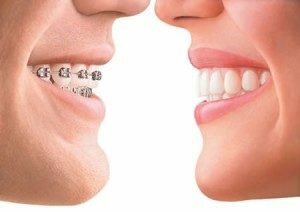 Braces, on the other hand can be extremely restrictive, uncomfortable and difficult to clean as well. Invisalign does seem like a much better option when compared to traditional braces. However, only your Los Angeles dentist would be able to tell you which solution will work for your specific condition. Invisalign is ideal for treating simple orthodontic cases while complex cases might need braces. Invisalign is currently approved for use in teen and adults. Young children may not really be good candidates for this orthodontic treatment option. Straightening your teeth does much more than give you a fantastic smile. While that’s a definite a plus, and often the primary reason people opt to straighten their teeth, there’s much more involved that will benefit your overall dental health. Well-aligned teeth are often easier to brush and floss, which helps keep cavities at bay. They can also help align your teeth and jaw and correct your bite. When you come to us for fixing alignment, crookedness and gap issues in your teeth, our dentist will first conduct a detailed assessment of your teeth and recommend a solution that would work best for your lifestyle. For more information or to schedule an appointment, please call Westside Dental Associates at (310) 945-2870 or use this online form to send queries. by: Les Latner at January 21, 2019 .